I found this terrific mural on Cook Street (just east of Graham Avenue) this week. 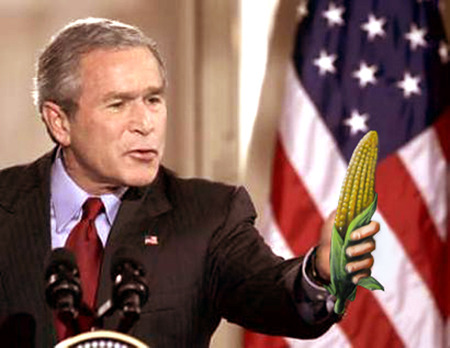 Why the agricultural imagery you ask? A farmer’s market is conducted on Cook Street between Graham Avenue and Humboldt Street (P.S. 257) from July to October. 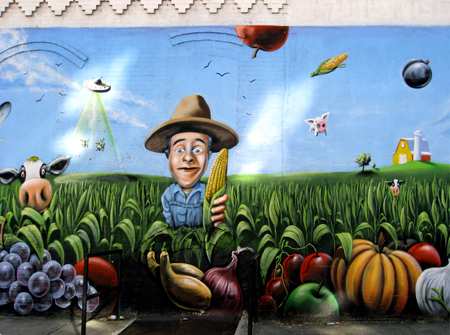 When I got home I later I realized the farmer in this mural reminded me of someone. It took me awhile, but I was finally able to figure out who it was: our nation’s fearless leader. Maybe it is the idiotic look on his face? Or it has something to do with his repeated corn-holing of this country (and our civil rights) for the last seven years? the Graham Avenue Farmer’s Market.